Domestic surveillance drone bans are sweeping the nation. States and cities are increasingly passing legislation to stop the use of surveillance drones. Draganflyer X4-P, drone-like surveillance helicopter. In the past year, the American public has begun to pay more and more attention to the issue of domestic surveillance drones. And now, recent events suggest we might be seeing the emergence of a genuine national movement against the use of surveillance drones by law enforcement. With any luck, this may even set the stage for a wider dialogue about the increasingly intrusive technologies that are intended to catch crooks—but that all too often cast an overly broad net. Last week, after an especially raucous city council hearing, the Seattle police department terminated its drones program and agreed to return the purchased equipment to the manufacturer. This came just days after both houses of the Virginia state legislature passed historic bills imposing a two-year moratorium on the use of drones by law enforcement and regulatory agencies in the state. 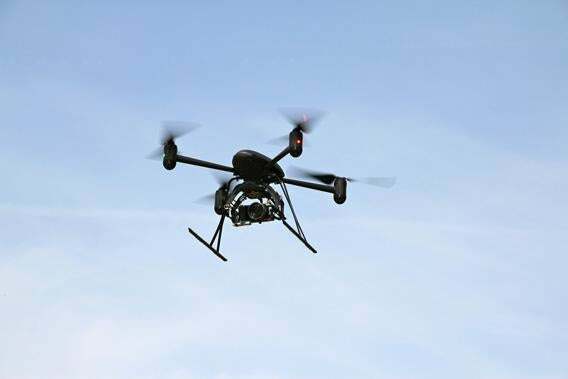 In Florida, a potentially even more significant bill imposing a judicial warrant requirement on police use of drones continued to march toward passage. Similar legislation has been proposed in at least 13 other state legislatures around the country so far. Of all the threats to privacy that we face today, why have drones caught the attention of the American public to such a remarkable degree? One possibility is that there’s something uniquely ominous about a robotic “eye in the sky.” Many privacy invasions are abstract and invisible—data mining, for example, or the profiling of Internet users by online advertisers. Drones, on the other hand, are concrete and real, and the threat requires no explanation. But they are just the most visible example of a host of new surveillance technologies that have the potential to fundamentally alter the balance of power between individuals and the state. Physically tailing a suspect requires teams of police officers working 24/7, but now police can slap GPS devices on a suspect’s car and then sit in the station house tracking his movements on a laptop. Now that the wholesale surveillance of American life is becoming cheap and easy, legal protections are all the more important. The ACLU of Virginia, for instance, teamed up with one of the state’s most conservative lawmakers to introduce a drone regulation bill in the state House of Delegates, while its Senate companion bill was introduced by a progressive. Florida’s drone regulation legislation is being almost entirely pushed by conservatives—and in most states, the legislative efforts we’ve seen so far have been conservative or bipartisan. Privacy issues are always less partisan than many other political questions, but the support for action on drones from both left and right has been remarkable. What we usually see happen with new law enforcement technologies is that agencies quickly and quietly snap them up, making their deployment a fait accompli before the public even learns of their existence, let alone has a chance to debate their privacy implications or democratically decide upon the correct balance between privacy and police power. At that point, taking privacy into account is an uphill battle because the tax dollars have already been spent and the technology integrated into the department’s approach to crime fighting. With drones, on the other hand, because of the safety and regulatory issues they raise, we have a chance to do it right. The American public and our elected representatives can, for once, get ahead of the deployment curve—we can raise awareness, propose protections, and build support for them before the problems hit us in the face. If done right, this moment of hyperawareness about privacy could become a more permanent state of affairs: Ryan Calo of Stanford’s Center for Internet and Society suggested in a December 2011 paper that because of their “disquieting” nature, drones “could be just the visceral jolt society needs” to spark broader changes in how Americans conceptualize privacy problems. Ultimately, the best solution on drones would be for Congress to pass strong, uniform rules protecting everyone across the nation and putting privacy concerns to rest. For example, law enforcement agents should not make drones general tools of surveillance but should instead utilize them only where they have a specific reason to believe that use of one will turn up evidence of criminal activity. Ideally, those protections would become a model for other, perhaps less vivid but equally intrusive technologies such as cellphone location tracking. But unless and until Congress acts, state and local resolutions and rules are the best thing Americans can do to protect our privacy from the enormously invasive potential of domestic surveillance drones. The upsurge in local activism around the country is just what’s needed to make this happen.